Shirts With Random Triangles: Ohio State adds prospects Justin Hilliard and Jashon Cornell to its 2015 recruiting class. Ohio State adds prospects Justin Hilliard and Jashon Cornell to its 2015 recruiting class. 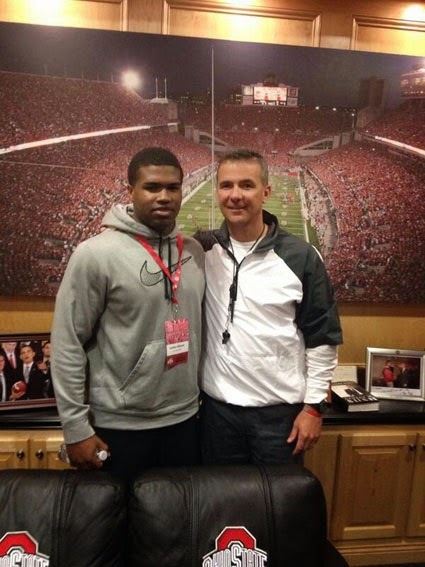 Justin Hilliard with Urban Meyer. Via theozone.net. Ohio State has gained two big commitments for its 2015 recruiting class. Cincinnati, Oh high school rising senior outside linebacker Justin Hilliard and St. Paul, Mn. high school rising senior defensive end Jashon Cornell both announced their commitments to the Buckeyes Wednesday morning. Both are ranked in the ESPN 300. Hilliard's 247Sports.com composite intangibles are as follows: Hilliard is a five-star rated OLB. He ranks second among all OLB prospects for 2015. He is the top 2015 prospect in the state of Ohio, and is the 21st-ranked overall prospect in the country. Hilliard is ranked 13th among 2015 prospects in the ESPN 300. Hilliard attends St. Xavier High School in Cincinnati, Oh. He stands 6'2", and weighs 230 pounds. Jashon Cornell. Via Eleven Warriors. 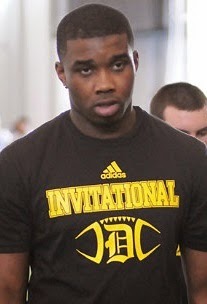 Cornell's 247Sports.com composite intangibles are as follows: Cornell is a four-star rated weak-side DE. He is ranked third among weak-side DE prospects for 2015. He is ranked first among 2015 prospects in the state of Minnesota, and ranked 37th among all 2015 prospects in the country. Cornell is ranked 16th among 2015 prospects in the ESPN 300. Cornell attends Cretin-Derham Hall High School in St. Paul, Mn. He stands 6'4", and weighs 260 pounds. Hilliard and Cornell become the 11th and 12th members of Ohio State's 2015 recruiting class.